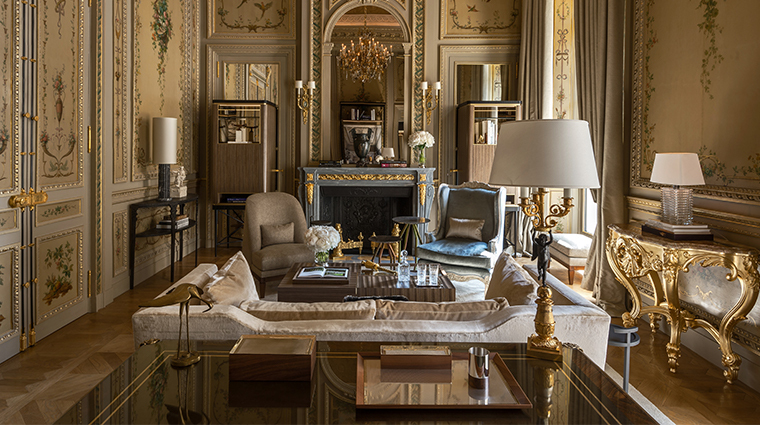 Following a 2017 renovation and restoration, Paris’ Hôtel de Crillon, A Rosewood Hotel shines brighter than ever with a blend of authentic grandeur and modern elegance. 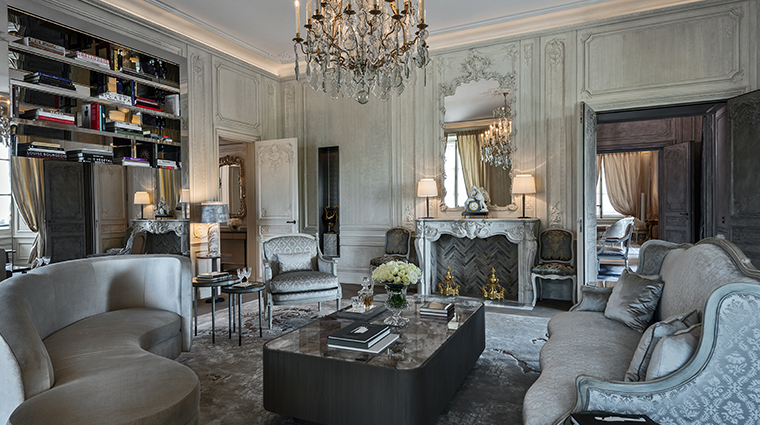 Housed in an 18th-century palace (originally commissioned by Louis XV and later owned by its namesake family, the Counts of Crillon), the opulent manor boasts an array of original details, including pink-hued marble floors, gold-trimmed wrought-iron stair rails and high painted ceilings. 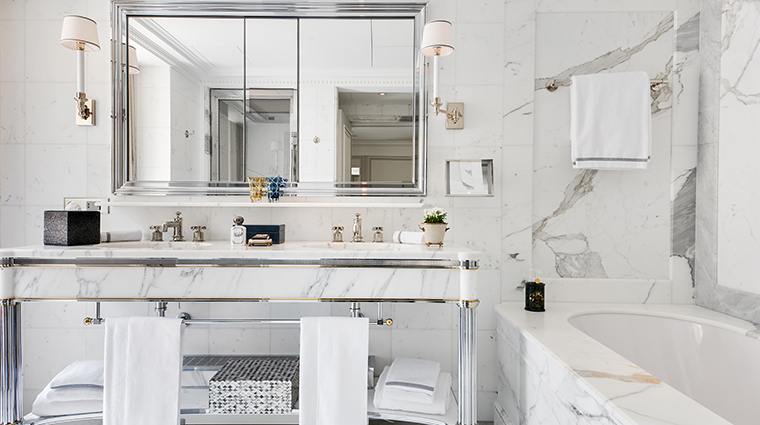 During the four-year transformation, architect Richard Martinet and a team of top designers stunningly repurposed the historic building, bringing its antique bones into the 21st century. 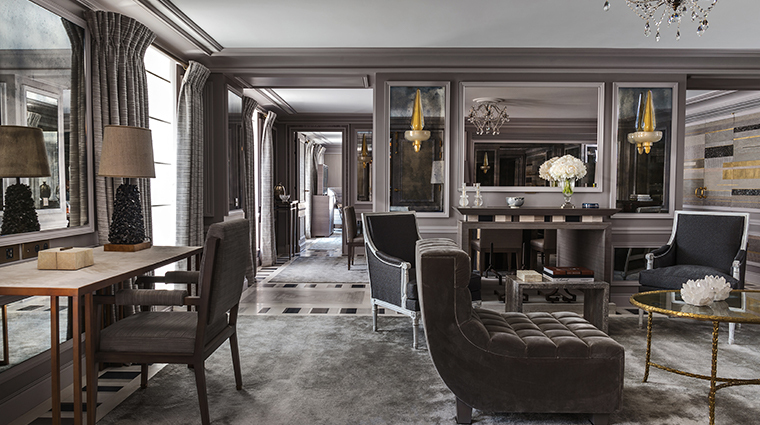 A private reception suite framed by the original acajou-paneled walls replaced a boutique. 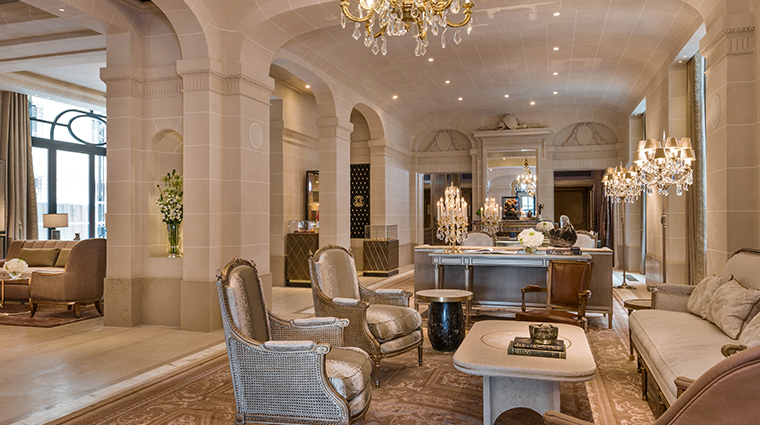 The concierge station moved to a side salon, where light from a grand floor-to-ceiling window shines on contemporary artwork displayed on pale faux-stone walls. 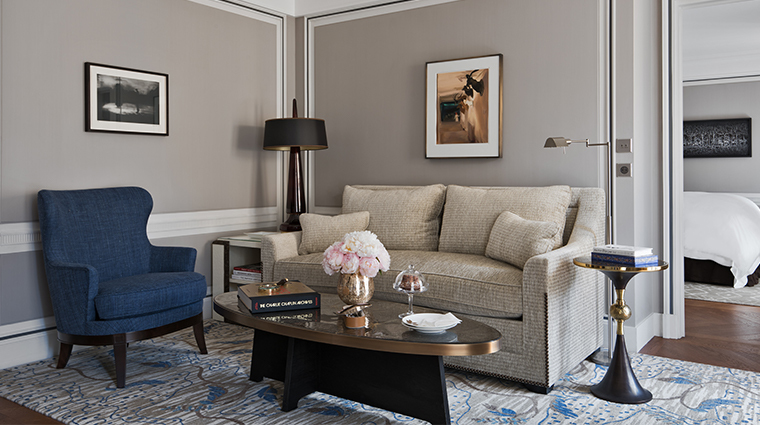 Throughout the ground-floor lobby, there are intimate, contemporary seating areas where the décor is elegantly urbane with softly rounded, often handcrafted, furnishings and occasional fanciful features. 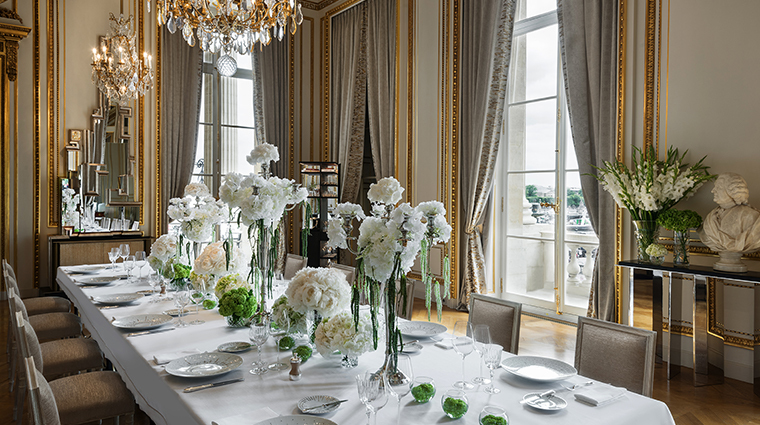 With a prime location facing Place de la Concorde, Hôtel de Crillon offers spectacular views of some of Paris’ most memorable landmarks, including the Eiffel Tower, the sculpture-filled Tuileries Garden, Musee de l’Orangerie with its Monet water lilies and Renoir portraits, and the tree-lined Champs-Élysées. 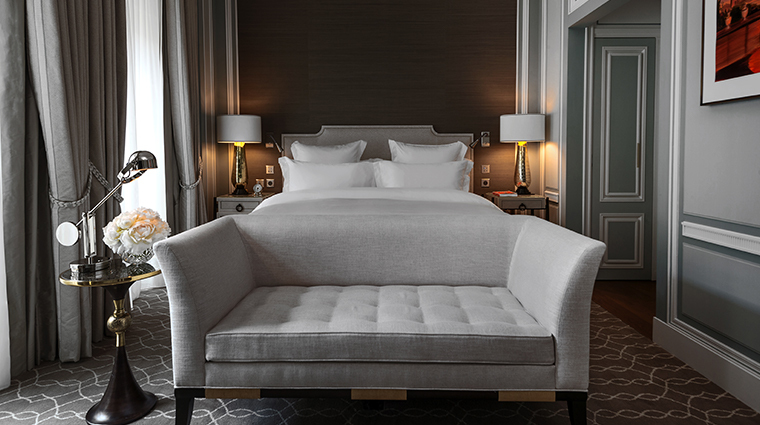 An A-to-Z list of designer boutiques is within footsteps of the luxury hotel; antique shops and art galleries line the Quai d’Orsay just across the Seine. There’s no need to leave the property for pampering. 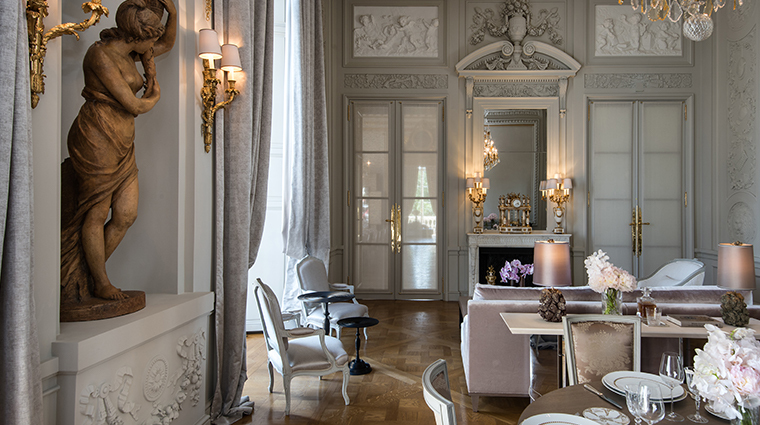 On the ground floor, you’ll find Sense, A Rosewood Spa; a hair salon by David Lucas; a barber by La Barbière de Paris; and a leather-care lounge from Devoirdecourt. Though small, the subterranean indoor pool is absolutely stunning. 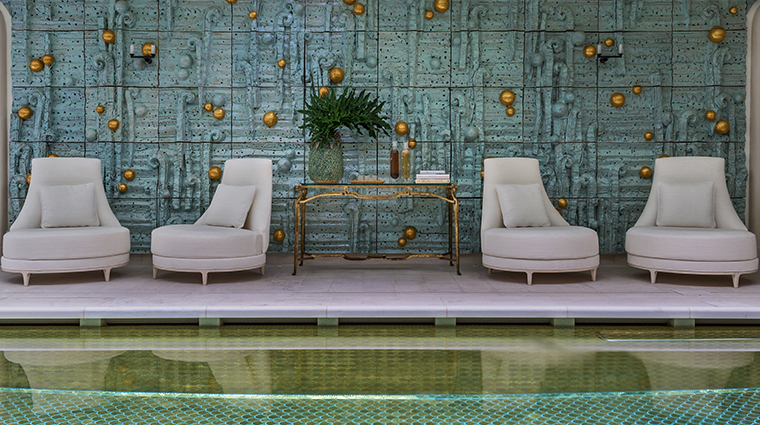 Surrounded by residential-style furnishings and an unusual faux-rock wall, the stylish Peter Lane-designed space isan Instagrammable backdrop. Be sure to order a glass of wine with dinner. The Paris property carries an impressive 40,000-bottle collection, including a selection of rare vintages dating back to the early 20th century. Take a step back in time with a spin in Hôtel de Crillon’s house car, a 1973 Citroën DS. To really impress your travel companions, ask the concierge to book you a private wine-paired dinner in La Cave, home to the hotel’s immense 40,000-bottle collection. Be sure to plan ahead if you want to stay at this fashionable address. Rates rise during major Paris events (such as art, design and fashion weeks) as well as the winter and May holidays. 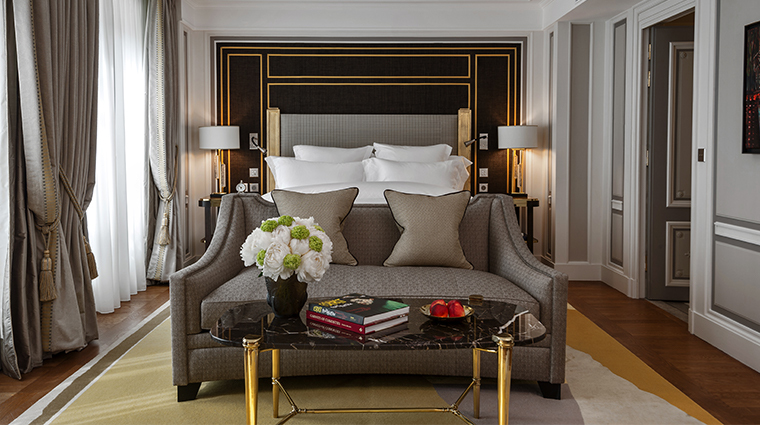 Even the base-level Deluxe Rooms at this Paris hotel are sumptuous. 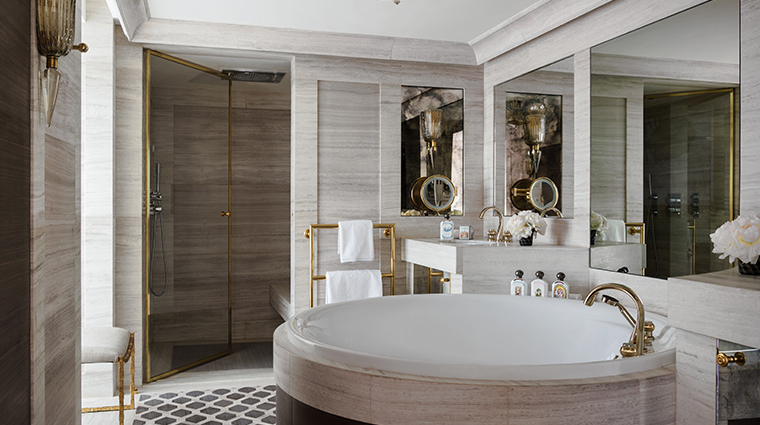 Starting at 340 square feet, the chic spaces include courtyard views, Rivolta Carmignani Italian linens, heated floors and in-mirror TVs in the bathrooms, and luxe Buly 1803 toiletries. No matter how spacious, all accommodations at this posh property feature a residential-style vibe with plush bedding, a neutral color palette and plenty of artwork. 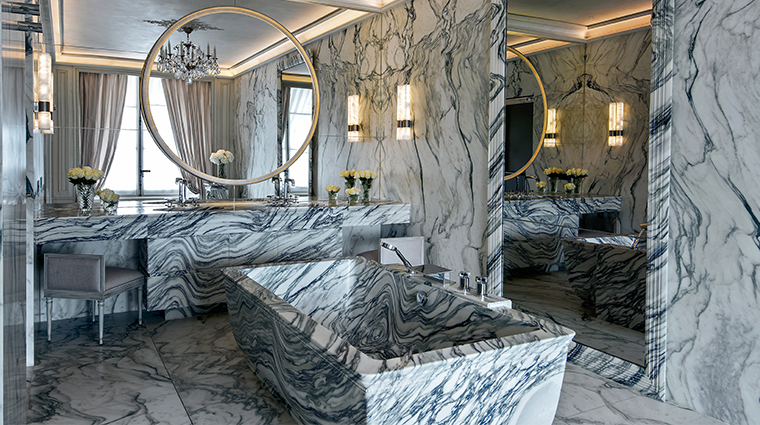 Ten signature suites offer an extra taste of opulence, each with its own unique style. 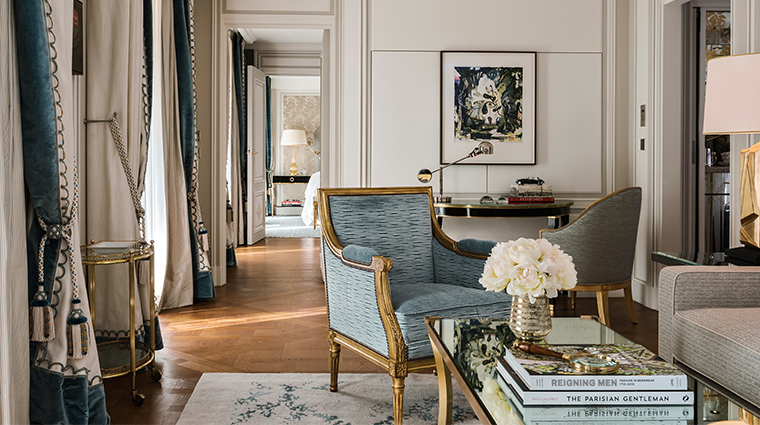 Suite (Leonard) Bernstein, for example, features a flower-bordered 1,200-square-foot terrace, Parisian gray walls, an oval dining room table for six, a massive oval bathtub and Eiffel Tower views. 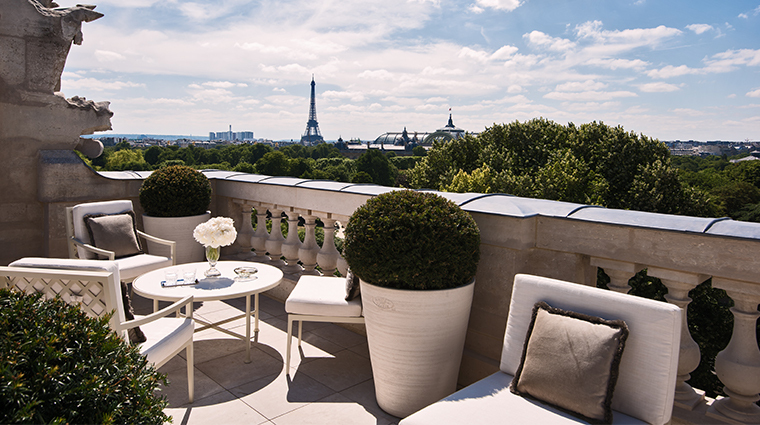 To feel like royalty in the City of Light, book one of the Karl Lagerfeld-designed Les Grands Appartements. 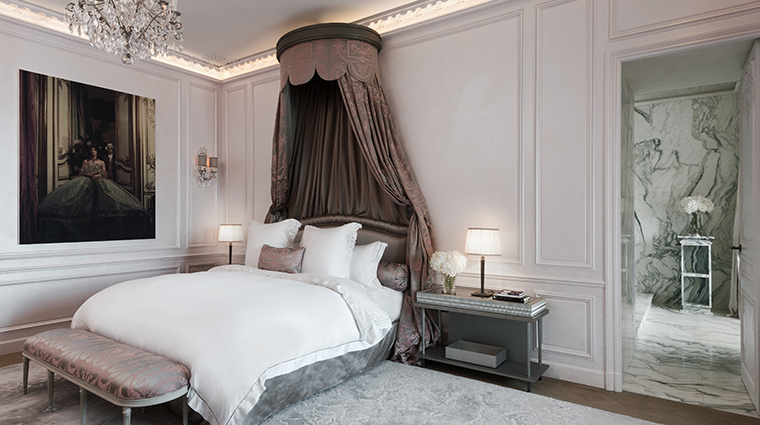 These two suites can be combined to create a palatial 3,606-square-foot, three-bedroom apartment, complete with crystal chandeliers, bespoke furniture, Carrara marble bathrooms and a Louis XVI-inspired canopy bed. 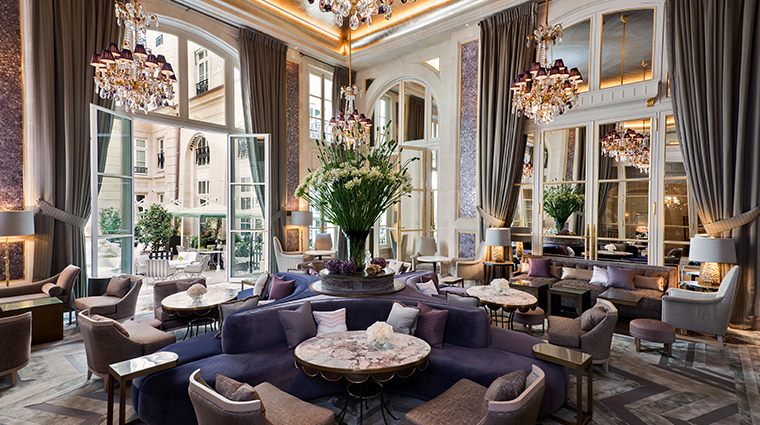 The inviting grandeur of the 60-seat Les Embassadeurs bar lures from its 45-minute lunch to live music and a late-night scene. 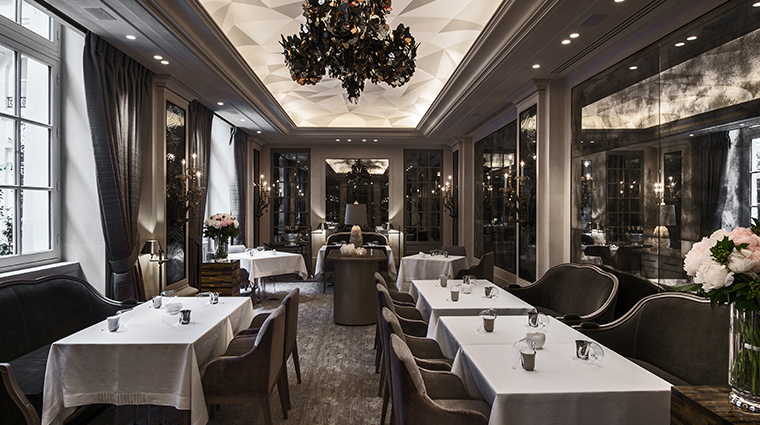 Chef Christopher Hache helms the kitchen at the intimate L'Ecrin, an elegant and contemporary spot for haute cuisine. 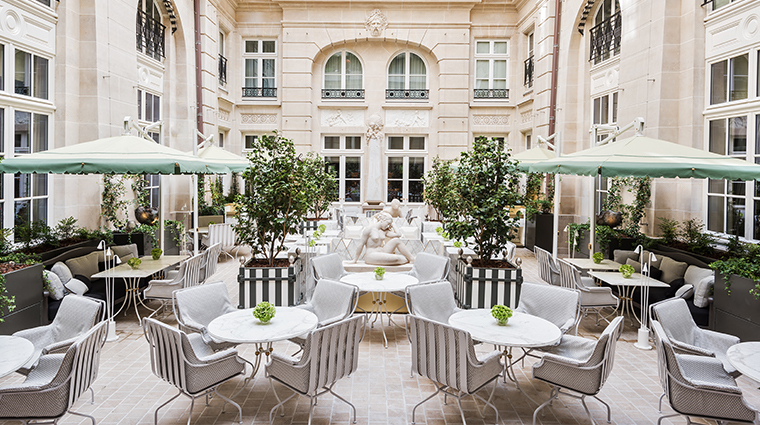 The chic dining room recently added a lunch service on Thursdays and Fridays — a wonderful way to kick off a weekend in Paris. 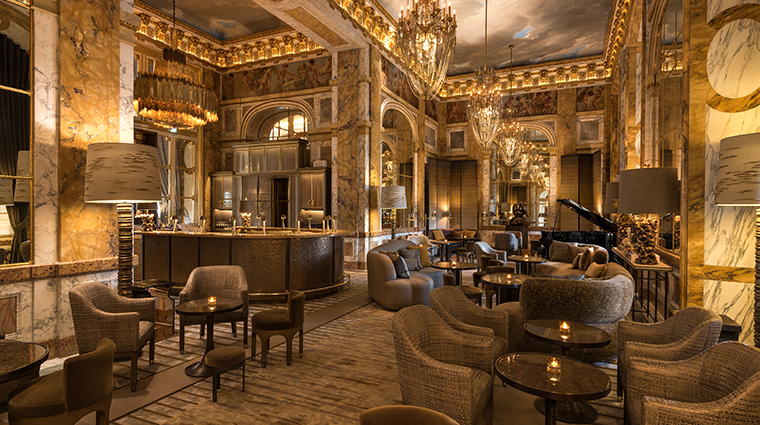 Visitors and locals alike sip cognac in the dark-walled boudoir and meet for afternoon tea in the historic Jardin d’Hiver. 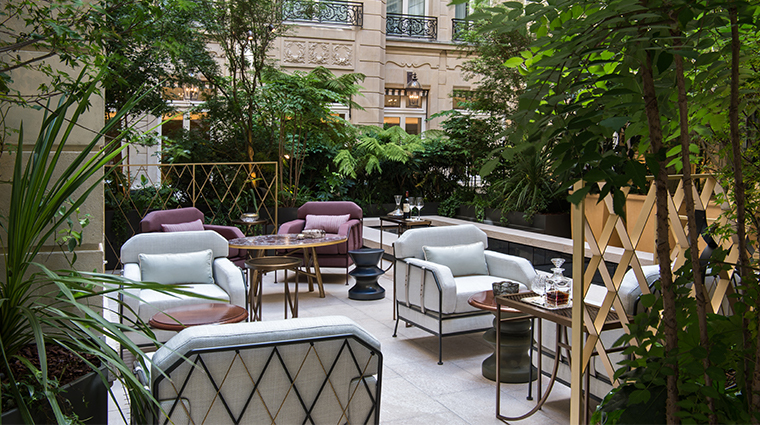 Chef Justin Schmitt heads the team at the banquette-lined Brasserie d’Aumont, a cozy space that opens to both the terrace and the courtyard. 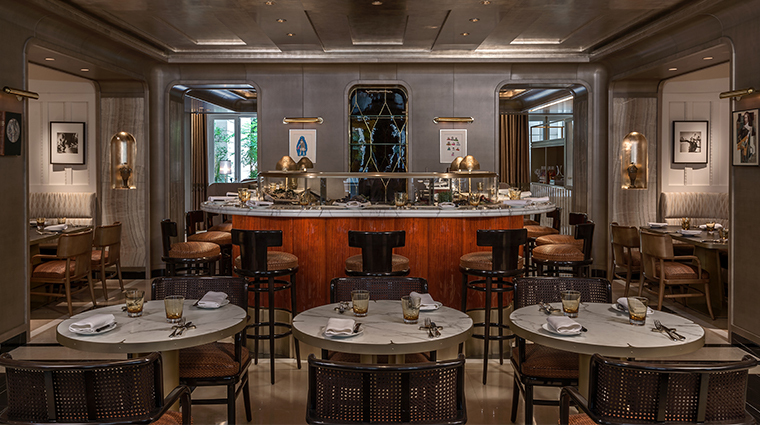 An exquisite raw bar is the focus here, while unique cuts of beef and a selection of cheeses and caviar are also not-to-be-missed highlights.